Blue Bell/Pottstown, Pa.— Eight students from Montgomery County Community College’s (MCCC) Gateway to College Program earned their high school diplomas this spring after completing the requirements necessary to graduate from their respective school districts. Gateway to College is a national network designed for young adults ages 16-21 who are at risk for not completing high school. One of only 43 Gateway to College programs in the country, MCCC partners locally with 16 area school districts and the Montgomery County Workforce Investment Board (WIB) to help increase high school—and ultimately college—graduation rates. Spring 2014 graduates include Meghan Benson, Wissahickon; Ne’Cole Casalena, Phoenixville; James Hanible, Pottsgrove; Erika Knappenberger, Souderton; Justin Leamy, Pottsgrove; Jose Ortiz Rivera, Hatboro-Horsham; Carlas Rich, Phoenixville; and Rachel Voltz, Upper Merion. All of the graduates plan to pursue post-secondary education, and at least six will attend MCCC in the fall. 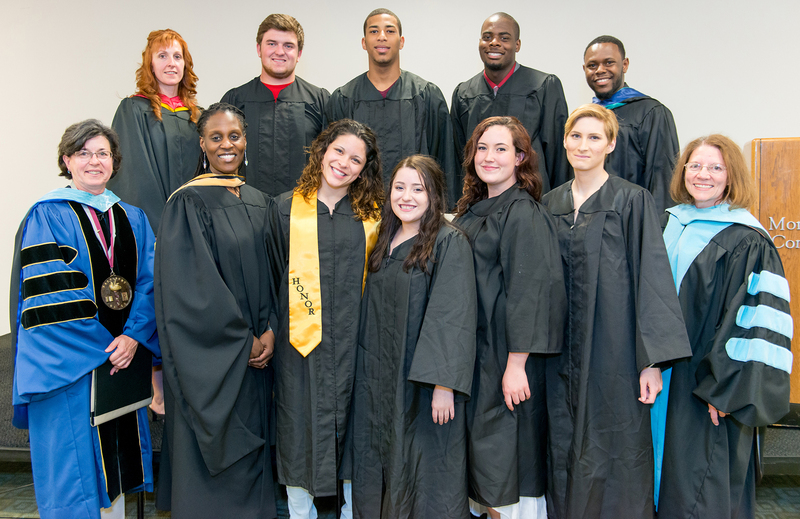 In only its first year at MCCC, the Gateway to College program has grown from 21 students in the fall to 52 this spring. At full capacity, the program will serve up to 150 students annually. Fifteen of MCCC’s students were recognized as Gateway Achievers by the Gateway to College National Network. Students include: Jose Ortiz Rivera from Hatboro-Horsham; Gustavo Ascencion from Norristown; Ne’Cole Casalena and Laura Krueger from Phoenixville; Brianna Gagliardi, Marcus Gordon and Anthony Romano from Pottsgrove; James Hanible from Upper Merion; Christopher Anderson, Shane Bowman, Jelani Crosby and William Dobnak from Upper Moreland; Shaquilla Anderson from WIB; and Meghan Benson and Emahnie Holmes from Wissahickon. MCCC also recognized spring Gateway students for their achievements. William Dobnak, Upper Moreland, and Laura Krueger, Phoenixville, were recognized as Foundation (first term) Students of the Semester. They also earned the highest GPA among MCCC Gateway students along with Jelani Crosby, Upper Moreland. Marcus Gordon, Pottsgrove, and Rachel Voltz, Upper Merion, were recognized as Transitioned (second term through completion) Students of the Semester. Students begin the Gateway to College program with a Foundation semester, during which they take classes in reading, writing, math, and college skills as part of small learning communities. After successfully completing the Foundation term, participants transition into one of MCCC’s academic programs, earning college credits while completing high school requirements. Throughout the program, students are advised and mentored by Gateway resource specialists Lori Davidson and Esau Collins. They also actively engage in college and community service. To learn more about the Gateway to College Network, visit gatewaytocollege.org.